Happy Holidays????? When I was a kid, way back in the dark ages, I always thought that “Happy Holidays” meant “Merry Christmas and Happy New Year.” Apparently I was a tad bit under informed…….. So once again, here we go………. It’s that time of year again. 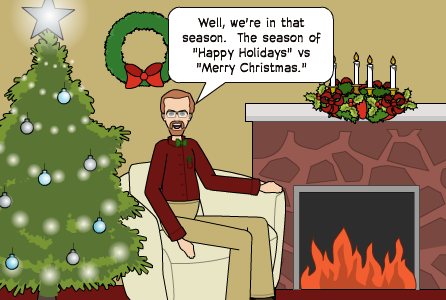 The time for all and sundry to argue the finer points of holiday greetings: Merry Christmas versus Happy Holidays. At the risk of being seen as a non-Christian priest, or a politically correct one, and abandoning or at least not defending my faith and my Lord, I feel compelled for some odd reason, to offer a treatise on the use of Happy Holidays. So here goes…. Leaving those “Happy Holidays” that are in the Christian calendar for a few minutes; let’s look at the ones that aren’t Christian holidays. The Winter Solstice, or Yule, is celebrated by our Wiccan and Pagan brothers and sisters. This is when the dark half of the year relinquishes to the light half. Starting the next morning at sunrise, the sun climbs just a little higher and stays a little longer in the sky each day. Known as Solstice Night, or the longest night of the year, the sun’s “rebirth” was celebrated with much joy. It is from this celebration that we get many, many of our Christmas traditions. Kwanzaa is celebrated by some of our African American brothers and sisters and is not a substitute for Christmas, nor is it a religious holiday. Wishing someone a happy Kwanzaa does nothing to deny Christianity. Hanukkah is a Jewish festival, celebrating a miracle that occurred way back in the 2nd century BCE. Also known as the Festival of Lights, it is an eight-day Jewish holiday commemorating the rededication of the Holy Temple (the Second Temple) in Jerusalem at the time of the Maccabean Revolt. The story of Hanukkah is alluded to in the book of 1 Maccabees and 2 Maccabees, but Hanukkah is not specially mentioned; rather, a story similar in character, and obviously older in date, is the one alluded to in 2 Maccabees 1:18, according to which the relighting of the altar fire by Nehemiah was due to a miracle which occurred on the 25th of Kislev, and which appears to be given as the reason for the selection of the same date for the rededication of the altar by Judah Maccabee. Now, 1 and 2 Maccabees are not considered canonical books by most Protestants, but are included in the Apocrypha, which IS in Catholic and Orthodox Bibles. So while Hanukkah is not a Christian holiday, per se, it can be considered Biblical. And since it celebrates the lighting of the rededication of the Temple and is celebrated with lights, and Christ is “the Light of the World,” and the fact that Christianity has its roots in Judaism, Happy Hanukkah to my Jewish friends! The day after Christmas is Boxing Day, which is celebrated in the Commonwealth countries. The tradition of Boxing Day has long included giving money and other gifts to those who are needy and in service positions, and this European tradition has been dated to the Middle Ages. Shouldn’t we, as Christians, do this year-round, and not just during the “holidays”? And then, there are the religious holidays that most Christians don’t really celebrate, and some don’t even know about. The Feast of Saint Stephen, who was the first Christian martyr on 26 December, the Feast of St. John who was the “Beloved Disciple” on 27 December, the Immaculate Conception of the Blessed Virgin Mary on 8 December, and the Feast of Our Lady of Guadalupe on 12 December have already been mentioned.